This article is about avatar of Vishnu in Hinduism. For the founder of Jainism, see Rishabhanatha. For the solar month in traditional Indian lunisolar calendar, see Vṛṣabha. Svayambhuva Manu is the son of brahma. Priyavratha is the first son of manu. from childhood itself he was the disciple of saint narada. according to grandfather Brahma direction he married twice. he had 13 children in these two wives. then he made night bright moving in his laminating chariot. agnidhra son of priyavrata saw an apsaras called poorvachitti, married her and lived a romantic life. nine children born in her. Nabhi is one among them. Being childless, Nabhiraja along with his wife Marudevi conducted a yajna for son. Mahavishnu appeared. asked for a son like vishnu. vishnu incarnated in meru as the son of nabhi. he is Rishabha. Aja is another name of rishabha. he is also known as rishabhayogeshwara. he was a good ruler. as the kingdom of aja & nabhi that place was named as Ajanabha. Indra became jealous in his rule and he stopped rain in that kingdom. Rishabha with his magical power created artificial rain. Losing the battle Indra presented his daughter Jayanti to Rishabha. Rishabha had 100 sons by Jayanti. Some became saints, some brahmins etc. Rishabha conducted a yajna. all his children participated in this yajna. he made a good speech on muktimarga there. bharatha is the king after rishabha. Ajanabha is renamed as Bharata in his name. Rishabha traveled though janapada, villages, forest, theertha, and he saw god and he died in a wild fire.he is considered as the paramaguru of sanyasadharma.He entered into forest fire to get rid of the body. He is god himself. The Vedas mention the name Rishabha. According to Sarvepalli Radhakrishnan, a professor of comparative religions and philosophy at Oxford who later became the second President of India, there is evidence to show that Rishabhdeva was being worshipped by the first century BCE. 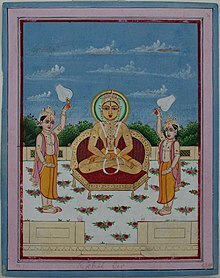 The Yajurveda [note 1] mentions the name of three Tirthankaras – Rishabha, Ajitanatha and Arishtanemi, states Radhakrishnan, and "the Bhāgavata Purāṇa endorses the view that Rishabha was the founder of Jainism". .[note 2] Elsewhere it is an epithet for the Hindu god Shiva (Rudra). 0 Rudra-like Divinity ! do thou produce amongst us, of high descent, a Great God, like Rishabha Deva, by becoming Arhan, which is the epithet of the first World Teacher; let Him become the destroyer of the enemies ! According to the Bhagavata Purana text, Rishabha is an avatar of Vishnu. According to D. Dennis Hudson, this interpretation of Rishabha as an Avatar might have developed during the same period when the details and stories of Jina Rishabha were constructed. India was named "Bhāratavarsha" or "Bhārata" or "Bharata-bhumi" after his son. In the Hindu text, Skanda Purana (chapter 37) it is stated that "Rishabhanatha was the son of Nabhiraja, and Rishabha had a son named Bharata, and after the name of this Bharata, this country is known as Bharata-varsha." The Vayu Puranas says he who conquers the whole of Bharata-varsha is celebrated as a samrāt (Vayu Purana 45, 86) however in some puranas, the term 'Bharat' refers to the whole Earth as Emperor Bharata is said to have ruled the whole Earth. According to the Puranas, India is known as Bharatavarsha after his eldest son Bharata Chakravartin. This has been mentioned in Vishnu Purana (2,1,31), Vayu Purana,(33,52), Linga Purana(1,47,23), Brahmanda Purana (14,5,62), Agni Purana ( 107,11–12), Skanda Purana, Khanda (37,57) and Markandeya Purana (50,41) it is clearly stated that this country is known as Bharata Varsha. "The country (varsham) that lies north of the ocean and south of the snowy mountains is called Bharatam; there dwell the descendants of Bharata." Some scholars state that this avatar is same as the first Tirthankara of Jainism. ^ For example: ऋषभं मा समानानां सपत्नानां विषासहिम् । हन्तारं शत्रूणां कृधि विराजं गोपतिं गवाम् ॥१॥ – Rigveda 10.166.1 Other examples of Rishabha appearing in the Vedic literature include verses 6.16.47 of Rigveda, 9.4.14–15 of Atharvaveda, 3.7.5.13 and 4.7.10.1 of Taittiriya Brahmana, etc. ^ Matchett, Freda (2001). Krishna, Lord or Avatara? : the relationship between Krishna and Vishnu. 9780700712816. p. 152. ISBN 978-0-7007-1281-6. ^ Wendy Doniger (2014). On Hinduism. Oxford University Press. pp. 593 note 49. ISBN 978-0-19-936009-3. ^ Suresh Chandra (1998). Encyclopaedia of Hindu Gods and Goddesses. Sarup & Sons. p. 26. ISBN 978-81-7625-039-9. ^ Prioreschi 1996, p. 205. ^ Radhakrishnan 1923, p. 287. ^ Bloomfield 1906, p. 293. ^ Dalal 2010, p. 88. ^ Hudson 2008, pp. 19–22. ^ Champat Rai Jain 1929, p. 159. ^ Umakant P. Shah 1987, p. 72. ^ Sangave 2001, p. 106. ^ Vishnu Purana. p. 44. ^ D Dennis Hudson (2008). The Body of God: An Emperor's Palace for Krishna in Eighth-Century Kanchipuram. Oxford University Press. pp. 19–21. ISBN 978-0-19-970902-1. This page was last edited on 22 March 2019, at 08:16 (UTC).